I’ve sifted through thousands of words I wrote since moving into our tiny house in preparation for my upcoming ecourse–a step-by-step guide to dreaming, planning, and designing a mortgage-free lifestyle. I came across this essay I wrote last winter. 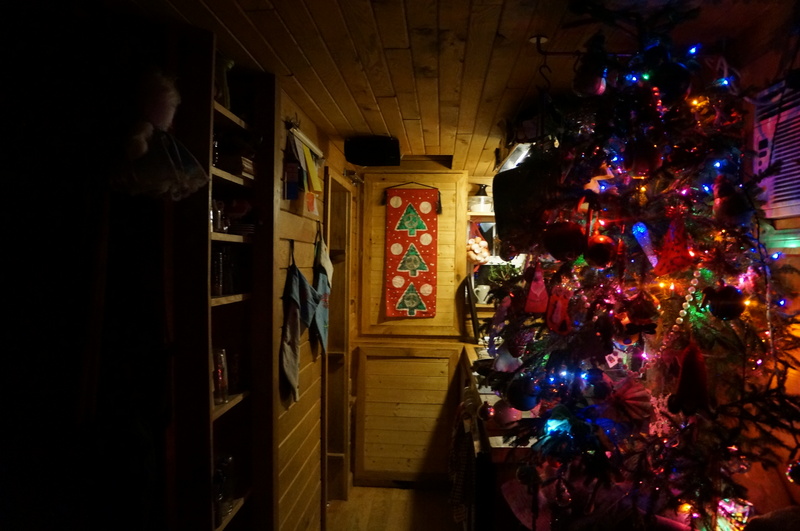 Winter is a real challenge in a tiny house, and I am grateful for it. In the darkest time of year we can most clearly see our own light. These years in this tiny space are healing us. I’m happy to say, the pain I wrote about in this essay isn’t as intense as it was then. Being honest with myself and others about the pain is an important part of healing. Opening the restaurant wasn’t stupid, it was a leap, and we gave it our all. I’m proud of us for that. With the distance of time, I can accept that things don’t always go as planned and see that the adventure continues. I share these words because I want to keep it real, and maybe someone out there is feeling something like this. You are not alone, and you will heal. I was falling asleep last night and thinking of my week. Karl reached for my hand. I have had a hard weekend. The temperature dropped and the sun went away and the kids are bickering like dogs. I want quiet and calm, but finding that means I have to raise my voice ’til it hurts. That’s not what I want to do. I feel tired of sharing so deeply. My kids see it too. “Yes.” But I don’t know. Maybe I don’t. I want to share from a deep and honest place and sometimes I have no wisdom about it. The rooster is crowing. It’s 17 degrees outside. Up the hill stand giant power lines. They crackle with static and electromagnetic force. The crackle is loudest when it’s humid. Sometimes it sounds like a waterfall. Last night, the kids and I were trying to decide what to do. Ella really wanted her best friend to come for a sleepover, but I couldn’t handle that, my friend posted a picture of a giant pile of pine debris on Facebook. “Let’s burn this. If you can see this, you’re invited.” I love standing next to fire, but leaving the house with temperatures in the teens to stand outside in a field where winds howl was enough to make us turn up the heat and stay put. Ella grabbed a note pad to brainstorm. Okay, we have these options: board game or yoga. We decided on yoga and the kids scurried up to their loft to grab yoga mats and dove into their cabinets to find the perfect workout attire. Archer had this zip-up v-neck shirt and he kept pulling it down to expose his chest and making a serious-guy workout face. Ella looked like a messy yogini leaping around like a ballerina. It felt so good to laugh. So we did modified yoga: one arm stretched and one reaching up the wall. We kicked each other in the head and dropped our legs sideways onto each other’s bellies. “I told you we needed to spread out.” But they just kept going like there’s nothing wrong with doing yoga in a pile. Kids are so good at being present. I love that. They know how live in the moment and enjoy it for what it is. Me, I work hard to stay in the moment. I’ve lost the natural ability. When did it leave? Okay, I guess I should admit it was stupid. We shouldn’t have done it. It was more than we had in us. It was a risk and it didn’t turn out how we had hoped. We’ve been struggling ever since. I think now the healing is beginning. It’s such a process: going through bankruptcy and foreclosure. The first part is getting back on your feet, the second part is getting over the guilt of not being able to pay everyone back. The third part is healing the ache of not being able to make it work. With my youth, I had a surefootedness and confidence that maybe got me here in the first place. Now, I feel weary from all the trying. Oh my sweet Ella, you are so present to the feelings and I love you for that. Yes, last night it was the tiny house that said you couldn’t have a friend over. Last night was the only night for you in your moment of frustration. But there are good times with friends. There will be more good times with friends. We just have to hold on to each other in this giant pile of yoga poses and get there. Karl says, “Life’s hard. We’ve had it especially hard. I know we have it easier than some, but yeah, we live in a tiny house with two kids approaching their pre-teen years. We’re building a bigger house with $10,000 to our name.” For now, I think. I toss to my side, close my eyes and hold his hand. I breathe in faith, breathe out love, and a tear falls onto my nose. Beautifully written. I think everyone has those moments. Yes, my friend. Thank you for sharing this post. Your words are the first that I have read this morning and these that you read now are the first I have written. It is unusual that I am on the computer so early in the morning. I prefer my journaling. I am hungry for connection and the TIny House Family is family. 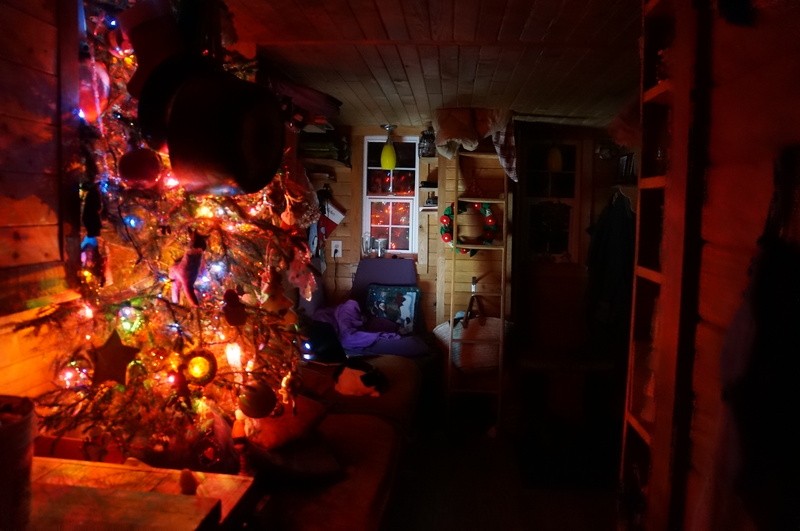 As I read your story from last winter, I was feeling the connection I share with you and the realness of living in a tiny space. I could hear Ella’s voice and I could see Archer puff out his chest in workout mode. I smiled. And, I felt my own pain. My own doubt and fear of moving once again with no home to call my own. Redesigning my life into what I can see in my minds eye. The handcrafted life forged in the burning passion of the heart. I have been holding it all together – problem solving, being optimistic, surrendering, being grateful. Recently, I have allowed the deep dark side to surface, again. I too know that when it is hidden it continues to occupy a space that secretly wants to be touched, seen, held, healed. Tears have been flowing for days. I need to be grounded and held safe for the pain to be released. Simply sharing this is helpful. Thank you. Beautiful, my friend. You are courageous and alive. Thank you for reading and for sharing. This life has a full spectrum of emotions. I’m grateful to have a space where we can share parts that are often hidden. So much love to you, dear one. Thank you, Liz! I love your soaps, and so do the kids. I hope your business did really well this season. Our celebration was simply lovely and we are seeing a lot of progress on the big house. It’s going to be a great 2014. Happy New Year!! I understand that struggle all to well. who knew how much mental and emotional stuff came with this ‘transition to a tiny house with children’ thing Lol thank you for sharing your heart and healing <3. You are feeling it too!? I’m grateful to the emotional healing we are doing in this little house. You are so honest! I see you growing as a writer right before my eyes. Thanks for the gifts you put out there to share with us. I honor them, your family, your journey. Thank you, thank you, Hari. Thank you for reading and giving me encouragement and support, Jane. It means a lot to know you are out there. Blessed New Year to you! Although I know I am not the only person in your universe (she says with a smile), when I read your post this morning I felt it was intended for me. In this year of loss, I am learning about deep grief and about healing. First, I am grieving the “loss” itself. Then, through the wisdom and experience of others who have experienced similar losses, I have come to understand that I am also grieving the loss of the future or the life that I thought was to be. For lack of a better way of putting it, I am also coming to understand that, with losses and significant and unexpected life changes also come opportunities. Your post resonated with me. I look forward to the opportunities a new year brings. I’m so glad that I wrote this for you. I’m so glad you feel that way. I’m so glad we are learning to share these moments and find support in each other. It is part of the human condition–pain, loss and grief. Wishing you a New Year full of new joys. Lots of love. re-position my yoga mat, shall we say, many times over the last 8 years on my own. Next month ….I will downsize one more time to live life larger in one home with 4 other single adult room mates. No worries. Hold hands, laugh, hug…. Spring and new beginnings are right around the corner! Hari, I am sorry for the losses you have suffered over the years– the problem with your restaurant and downsizing to a smaller home; but as I read your entry about the yoga pile I could not help but be envious. My kids are grown. I home schooled them and now they are following their dreams,but at this time of the year, I would give anything to go back in time and us all be huddled together. Even though I spent a lot of time with them both I also worked a part time job at night after my husband came home and that job was mainly so we could have more “things”. Looking back, I regret that choice to work. You live in a tiny house which am sure is not easy with two lively kids but it affords a closeness you may someday,like me,long to have again. On days when the closeness seems stifling,do more yoga–keep breathing, lean in, draw them close and savor the moment. Namaste. Thank you, Sue. This is good advice. I value your wisdom. Namaste. What curve balls life throws at us. I’m glad to know you’ve found new positions for your yoga mat. Your new home life sounds like it could be a lot of fun. Here’s to new beginnings and spring! Your writing makes me feel so close to you, even though we haven’t seen eachother in ages. I think of you guys all the time, and say silent prayers for all to go well for you. I’m a bit blue lately as well. Much love to you all during the season’s change, and tell Karl to keep holding your hand. I love you from my hair to my tiptoes. Thank you for coming here and reading my words. I love seeing you pop up on the comments. I love you. “O choro pode durar uma noite, mas a alegria vem pela manhã.” Bíblia Sagrada. True true true! And the joy is greater cause of the weeping. Hold fast to this knowing, everyone! Também leio seu blog pelo google tradutor. voces são pessoas fortes e de bem. Deus será com voces. Força e fé voces merecem!xoxo. I also read your blog by google translator. you guys are strong and good people. God be with you. Strength and faith you guys deserve! Xoxo. I found your blog just today as I am searching for the solutions that seem to elude me. Earlier today when I was journaling, I wrote, “How I wish I could go back in time, and undo the bad choices, undo the mistakes. Someone wrote that when you find yourself in a hole, you should stop digging. But what if the hole is so deep that you cannot climb out. If you stop digging, you will be stuck in the hole forever. What if the only option is to keep digging, hoping you come out on the other side?” In less than two months I have been bombarded with the loss of health insurance, and a cancer scare with the biopsy and other tests completely wiping out my savings, followed by my seventeen year-old car breaking down, frozen water pipes, a space heater I was using to try to thaw those frozen pipes starting a house fire when it was -10, and now my house needing repairs that seem overwhelming and requiring far more energy and skill than I have. This morning, when it was -19 outside, my kitten woke me up by knocking a glass full of cold water off the shelf above my bed on me, and I wondered if anyone has ever had a nervous breakdown because of a cat. But I know it isn’t just the kitten with ADHD. It is everything coming fast and hard, and so close together, and thinking if only I had done this or that differently. I am sorry for the struggles that you and your family have been through that have led you to where you are now. But please know that your words have helped someone who is in the midst of turmoil right now. I hope that someday I too will be able to write that I am healing, that I have made it through, and am getting myself back on my feet again. Thank you for helping me to see the possibility of light at the end of this dark tunnel–or on the other side of this hole I have dug myself into. This time is so hard and you write it so beautifully. Blessings of peace. Return to your breath. This too shall pass. Really. Lots of love! I am looking at tiny houses because we too are starting over after a leap, or several of them. This was tremendously encouraging :)Thanks for writing.